As a one-person communications shop for my department, I wear a lot of hats. Some days I’m 100 percent focused on writing, web projects, or developing a strategy for a key audience. Other days I focus 20 percent of my day on five different areas and/or projects. This is both the best and the worst thing about my job. No matter the hat I’m wearing on a given day, I find myself repeating certain tasks on a regular basis. Even on days when a given task doesn’t feel particularly exciting, I try to remember that being faithful to these tasks — developing routines and sticking to them — matters. How can you better engage with your organization’s social media audiences if you’re not posting regularly? How can you make donors feel valued and appreciated if you’re not thanking them promptly? How can you maintain a great website if you’re not reviewing top-level content on a regular basis? These are just a few examples. Your examples may be entirely different. Whatever the routine tasks look like in your work, go out and do them with excellence, even if it’s the 100th time around. It still matters. Despite the many articles titled “Email is Dead!” or “Email is Dying!” or “Email Jumped the Shark in 2010,” I still find email marketing to be a powerful tool. When done right, it allows organizations to share information directly with the people who really want to hear from them. 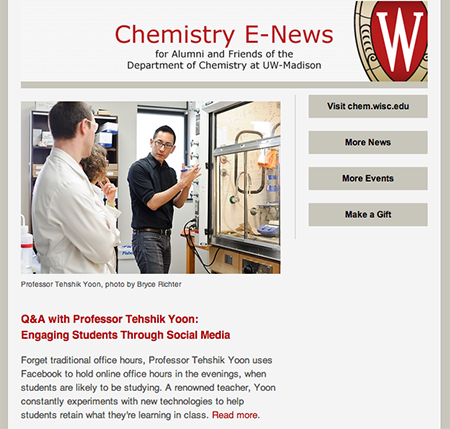 I just sent out the first issue of our new Chemistry Alumni E-News, and I thought now would be a good time to reflect on the process and the project. As I came into this new role, I knew there would be a lot of opportunities to push our departmental communications in new directions. Since there had never been a communications specialist role before, the department had never had the capacity to generate stories and communicate with our alumni and donor audiences regularly. We had always sent a rather exhaustive yearly print newsletter to our alumni, but that was about the extent of our regular communications. It was rather apparent that we needed to communicate with our alumni and friends more frequently. Additionally, I had already begun writing stories about what was happening in the department. Thus, we already had great content out on our website, but unless an alum visited our website regularly, subscribed to our news via RSS, or engaged with us via Twitter or our Facebook page, they might never have seen those stories. In February, as I was getting ready to send our yearly print newsletter to the printer, I went ahead and set up an opt-in form on our website to allow alumni to sign up for the new e-newsletter. I also put a teaser for Alumni E-News in the print newsletter that included a call to action for alumni to sign up. A few people signed up, but it wasn’t a roaring success. In March, I sent a very brief survey out to about 10 alumni who had either already signed up for Alumni E-News or who were engaged with us on social media. I asked them how often they would want to receive the Alumni E-News issues, what types of content they wanted to see in each issue, and left room for additional thoughts or ideas. Respondents were not as interested in notes from the chair, department seminars/colloquia, and university news. As a team of one, if there’s an easy and effective way to do something, then I’m not going to re-invent the wheel. I’ve used (and loved!) the MailChimp email service before, so I stuck with that. I’ve heard good things about Constant Contact, Vertical Response, Emma, and a few other services as well, but I like that MailChimp lets you send to lists of fewer than 2,000 subscribers for free. I started with one of their responsive email templates and customized the template a bit. View our first issue. Branding: Would a recipient know this email is coming from your department just by glancing at it? Does it align with your university’s visual identity? Content: How many stories will you include? What types of stories? Will you include photos or videos? Tone: Will your stories, blurbs, or other content sound formal? Fun? Exciting? Traditional? Conversational? Customization: How much time can you devote to customizing the template? Will other team members be able to navigate the template easily? At this point, I still only had a few subscribers for Alumni E-News. About a week prior to my anticipated send date for the first issue, I sent out an email to alumni of our department telling them about the e-newsletter and inviting them to sign up using a form on our website. About 10 percent of the alumni who received the opt-in email signed up to receive Alumni E-News. Our subscriber count is currently in the hundreds rather than in the thousands; however, I would rather have 50 subscribers who are expecting to get our e-newsletters and are looking forward to hearing from us than 5,000 subscribers who don’t know how they got on our list and aren’t as excited to hear from us. I also began talking about Alumni E-News on our social media channels leading up to the first issue. Finally, at our graduation reception the week before the first issue was scheduled to go out, I asked graduating seniors and grad students if they wanted to sign up for Alumni E-News. On their end, it was a simple yes or no. When the first issue went out this week, it was probably the very first alumni communication piece any of these graduates had received from our department or institution. We talk so often about shepherding relationships with individuals along a path, as they go from prospective students, to enrolled students, to alumni, and perhaps eventually become donors or advocates. This was a simple way to engage with graduates at one of those important transition moments. This is the easy part: schedule that email to send! I looked at MailChimp’s post “When is the best time to send emails?” and decided to send on a Wednesday at 1 p.m. CST. Day and time are definitely two factors that are worth testing, but you have to start somewhere! I’m already thinking ahead to our next quarterly issue, and there are so many things I want to test over time: day and time to send, subject lines, different types of content, etc. As the list grows, there will be new considerations as well. It may eventually make sense to segment the list by degree type, location, or some other factor. For now, I’m okay with having established a good starting point. And there’s a bonus: because I started with a list of subscribers who opted in, so far the email has a 68% open rate and a 29% click rate. It’s a start! John Maeda, president of RISD and renowned designer, recently posted a comparison chart to demonstrate characteristics and attitudes that differentiate authoritative leaders from creative leaders. Having worked with both types of leaders, I found these lists inspirational. I aspire to resemble the creative leader more and more. It strikes me that being a creative leader requires a lot of trust. You need to trust that you’re working with people who will rise to meet challenges and who will respond to your openness and flexibility with those same qualities. In contrast, authoritative leadership is really about checking off boxes, CYA, and making sure you’re never wrong. I don’t know about you, but to me, this type of leadership sounds very stressful and unsustainable. What are You Really Thinking? Which characteristic inspires or challenges you? Have you ever noticed how hard it is to let go of certain audiences? It’s tempting to include everyone. And working in higher education (and especially in public higher ed), it can be even harder to let go, because isn’t everyone a learner, and isn’t it our job to reach out to everyone? I’m constantly re-learning this lesson: Knowing who my strategic audience is, and also who it’s not, makes my stories and projects better. It’s really hard to write a compelling story when the audience could be prospective students, current students, alumni, donors, parents, the media, faculty, staff, other institutions, other scientists, the local community, and the campus community. It’s a little easier when it’s alumni. Or when it’s the media. Or when it’s donors. It’s hard to let go. But it’s also the only way to win. Surprise: I’m almost one month in at my new position as the communications specialist for the University of Wisconsin-Madison Department of Chemistry. Since the beginning of the year, my mentor has been encouraging me to think about what I want the next steps in my career to look like. And although I’ve absolutely loved the challenge and learning opportunities associated with working within a research group located on campus, I’ve really missed being plugged directly into the campus community and working for the direct benefit of students. In my new post, I’m focusing on department-level communications and advancement. The great news is that there’s never been a better time to work in advancement at a public university. The community here at Wisconsin knows that this is a priority, and the campus community is really working to coordinate strategic advancement efforts across the university, while still allowing a lot of freedom at the department/unit level. I’m stoked to be in such an amazing department, working with amazing people. More to come as I continue to settle in! Once you’ve identified the most appropriate social platforms for your organization, gotten started, and begun evaluating emerging social platforms, it’s time to begin measuring and adapting your approach. If you work in a team environment, consider creating a regular report that helps your team members understand what you’re doing and what you’ll be focusing on addressing in the next phase. The frequency and level of detail are up to you. Personally, I’ve found that a quarterly report out to my team members is most helpful. I prepare an 8-page web and social media report that includes an executive summary at the beginning. Within the report, I try to identify key events that have driven traffic at specific times during the quarter. It’s important to note, however, that focusing on the number of Twitter followers, Facebook fans, or raw pageviews isn’t enough. The goal in this measuring and adapting process is to look at trends over time, (e.g., year over year). I try to pick three to five take-aways each time I report on web and social media analytics and metrics. These can be anything from noting a page that has a short average time-on-page and reviewing the content, to noting trends in the top blog posts for the quarter and considering how to schedule more posts like those, to reviewing the referring domains and investigating why visitors were coming from those sites. Your team will likely also raise questions that will drive you to investigate further. I’ve been using Google Analytics and Adobe Omniture in addition to native social media analytics tools (e.g., YouTube, SlideShare, MailChimp), as well as homemade reports and graphics in Excel. Have you been working through this same process for your organization? If so, I’d love to hear your promising practices and learn from you! Or, if you’re just getting started, I’d be happy to share a copy of the pdf report I’ve developed.